Great Lakes shipping and travel shaped Michigan's history. Along the state's 3,200 miles of shoreline, more than 2 dozen museums and historical sites help preserve that maritime tradition. Tour lighthouses that still stand guard over treacherous shoals, and museums that tell tales of tragic wrecks and valiant rescues. A ship, permanently docked as a museum, provides glimpses of sailors' lives and work. Visit this sampling of maritime museums and discover others when you travel in Upper Michigan. Museums are open for visitors during the summer and for special events. Click here for a Map showing the location of the lighthouses that are open to the public. Scenic boat cruises offer views of some of the lighouses on islands and reefs in Lake Superior and Lake Huron. Take an Upper Peninsula Lighthouse Tour and visit these historic Light Stations. Copper Harbor Lighthouse and Museum on the Keweenaw Peninsula. Sorry but this lighthouse is no longer open for tours. The boat tour from Copper Harbor State Marina to the Copper Harbor Lighthouse is closed due to the absence of a contractor. The Copper Harbor lighthouse is located on state park land; however, the area between Fort Wilkins Historic State Park and the lighthouse is situated on private land and passage between the two is NOT allowed. North of Newberry, MI at the site of the old Crisp's Point Lifesaving Station. Only the Tower remains and it is open on weekends during the summer for climbing.Take CR-500 north from M-123 to CR-412. Follow CR-412 to the Lighthouse. Watch for signs. Gravel road through the wilderness. Photo at top of this page. Located 1 mile off-shore at the mouth of the St. Mary's River in northern Lake Huron, between DeTour Village and Drummond Island in the far Eastern Upper Peninsula, this light was built in 1931 to replace the 1861 DeTour Point Light Station. The 3 1/2 order Fresnel lens is on display at the DeTour Passage Historical Museum in DeTour Village. 2 hour guided, narrated tour of the Light on Saturdays or Sundays in June, July, and August. Volunteer light keepers weekends available during the summer. * St. Mary's River Lighthouse Cruise from DeTour Village to Sault Ste. Marie on Fathers Day. Return to DeTour Village by bus that evening. This is a major haunted lighthouse. Read a first hand account by a former resident. Marquette, MI. Built in 1853 and now open for tours. Stop at the Maritime Museum across the street for tour information. 300 Lakeshore Boulevard. Marquette, MI 49855. Phone: 906-226-2006. Open third week in May through October. Lighthouse Tours daily at 11 am, 2 pm, & 4 pm Monday-Saturday and 2 pm on Sunday during the summer or by appointment during the off-season. Stop at the Historical Museum on River Road. Lantern Room open for climbing with an awesome view of Lake Superior and the Porcupine Mountains. 5th Order Fresnel Lens and keepers logs on display at the Museum. Gift Shop. 25 miles north of Houghton on the Keweenaw Peninsula. Tours daily at 3 pm. Grounds open from noon to 4pm. Sand Point Lighthouse Baraga, MI. Located on Keweenaw Bay in Lake Superior, the keepers dwelling has been recently restored to its original beauty by the Keweenaw Bay Indian Community. The dwelling is not open but visitors are welcome to tour the grounds. Listed from east to west. Seul Choix Lighthouse and Sand Point Lighthouse are open for visitors. Naubinway Island Light is on a small island about 1 mile offshore in Lake Michigan surrounded by rocks and shoals. Established in 1931 to guide local vessels into the harbor at Naubinway. Original skeleton tower renoved and replaced by white cylindrical tower. Active light. MANISTIQUE EAST BREAKWATER LIGHT. This picturesque red lighthouse is on the end of the breakwater at the east end of the harbor where the Manistique River flows into Lake Michigan. It can be conveniently viewed from the Boardwalk or the Park near the Harbor and Marina. Hiawatha National Forest at the southern tip of the Stonington Peninsula. Tower is open for climbing and there is a nice picnic area. 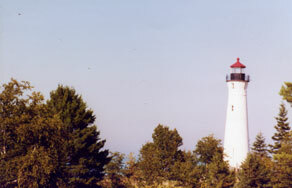 The Minneapolis Shoal Light can be seen on a clear day. South of Rapid River on CR-513 about 17 miles. RV's and tall vehicles need to park at the parking lot and walk about 1 mile to the lighthouse as the road goes through a tunnel of low trees. Mary Terry, one of the first women keepers on the Great Lakes, kept this light from 1868 to 1886. Cedar River Range Lights were located at the mouth of the Cedar River. The Front Range was buily in 1889 and the Rear Range built in 1891. Both lighthouses were square pyramidal wood skeletal towers and have been demolished. The Keepers Dwelling, a 1 & 1/2 story brick and wood structure and the old oil house survive and are privately owned. Marinette & Menominee North Pierhead Light was built in 1927 and is a red tower with a black lantern mounted on a concrete platform. You can walk on the pier out to the lighthouse in good weather, but the lighthouse is closed to visitors. This is an active light marking the harbor. Located 10 miles south of Marinette at the mouth of the Peshtigo River. The Lighthouse is 3 miles offshore on a trecherous reef and can only be seen by boat. DeTour Reef Light is located in the St. Mary's River between DeTour Village and Drummond Island. The DeTour Reef Light Preservation Society is restoring this light and offers 2 hour guided, narrated tours on Saturday or Sunday during June, July, and August. Phone 906-493-6609 or e-mail drlps@lighthouse.net. Click Here for dates, prices, and times of departure. Lighthouse Keeper Program. St. Mary's River Cruise from Detour Village to Sault Ste. Marie on Fathers Day. Return that evening by bus to De Tour Village. Sand Point Charters, Keweenaw Peninsula, offers Lighthouse Cruises, Charter Fishing, and Scenic Tours on Lake Superior. Boats leave from Lac La Belle, 40 miles north of Houghton/Hancock for a wonderful day or ½ day on the water. Fish for Lake Trout, view the offshore lighthouses, or take a relaxing cruise along the beautiful shoreline of the Keweenaw Peninsula. The Lighthouse Cruise includes the Gull Rock Lighthouse, Mendota Lighthousem and the Manitou Island Light. A custom cruise can be arranged to view the Granite Island Light, Stannard Rock Light, the Huron Island Lighthouse and the lighthouses on Isle Royale. Captain Brian Helminen has over 35 years of boating and fishing experience and the boats are DNR inspected and approved and equipped with essential fishing equipment and USCG approved safety gear. Phone 906-370-2257. LIGHTS THAT CAN BE SEEN FROM YOUR CAR OR WITH A SHORT STROLL. There are also many lighthouses on Lake Superior and Lake Michigan that you can easily see from your car but they are not open to the public. Some of the off-shore Lighthouses in Lake Superior can be seen by charter boat. Also called the Grand Island West Lights or the "End of the Road"
Shipwreck Tour or the Pictured Rocks Cruise. Located on Lake Superior, 23 miles northwest of Marquette. This light was established in 1896 and automated in 1945. The Big Bay Pointe Lighthouse is now privately owned, but may be viewed from the road. Built in 1870, the Mendota Lighthouse is located across from Bete Gris near Lac La Belle, in the Keweenaw Peninsula. The Lighthouse guided ships into the Mendota Ship Canal. There is no public access as this lighthouse is privately owned. The Eagle River Light Station was first established in 1854 on a bluff at the mouth of the Eagle River and once guided ships into this busy shipping port. With the dangerous Sawtooth Reef offshore, this lighthouse was very important during the copper boom with tons of copper shipped from the nearby Cliff Mine. The original lighthouse fell into repair and was rebuilt in 1874 and housed a 6th order Fresnel Lens. The light was deactivated in 1908 as the copper boom at Cliff Mine came to an end. Unfortunately, the Sand Hills Light Station a few miles west of Eagle River at 5 mile point was not constructed until 1917 and at least 10 ships were lost on Sawtooth Reef located off the shoreline at Eagle River. The Sand HIlls Lighthouse is privately owned and is a Bed and Breakfast Inn. PORTAGE ENTRY EAST LIGHT, also called the Keweenaw Waterway Lower Entrance Light is located on a concrete pier by the town of Jacobsville, on the north side of Portage Lake. This light can be viewed from Jacobsville or the Portage Entry Roads south of Chassell. The Portage River (Jacobsville) Lighthouse was first lit in 1870 housing a fifth order Fresnel lens. It is located in the town of Jacobsville at the entrance from Lake Superior (Keweenaw Bay) to the Portage River. The light was deactivated in 1900 and replaced by the Keweenaw Waterway Lower Entrance Pierhead Light. The lighthouse is still standing and is privately owned. SAND POINT LIGHTHOUSE IN BARAGA. Located on Sand Point (Keweenaw Bay) one mile north of Baraga the lighthouse was built in 1887. The lighthouse is privately owned by the Keweenaw Bay Indian Community and not open for visitors, but visitors can walk on the grounds. Go north of Baraga on US-41 and turn right on the road past the Department of Natural Resources Building that goes to the Ojibwa Campground and follow the signs. MARQUETTE MARITIME MUSEUM, 300 Lakeshore Boulevard. Marquette, MI 49855. Phone: 906-226-2006. The museum showcases the history of the areas shipping industry. Open the third week in May through October. Guided tours of the Marquette Lighthouse. Operational Fresnel Lens from Stannard Rock, one of the largest lenses used on the Great Lakes. Edmund Fitzgerals display. World War II Silent Service Memorial honoring USS DARTER and USS DACE crews. Gift shop with maritime books, CD's , videos, lighthouses, and nautical gifts. EAGLE HARBOR MARITIME MUSEUM at the Eagle Harbor Light Station. Open mid June through mid October. Life boat from the Eagle Harbor Life Saving Station. MUNISING COAST GUARD STATION MUSEUM near the end of Sand Point Road in the Pictured Rocks National Lakeshore has the 36' motor lifeboat, "Grand Marais" on display in the old boathouse. When you come so far to see us.